These bunnies are working off some of their excess energy by participating in their favorite sports activities. No sitting in front of the TV or computer for them! There are too many new things to do and try. 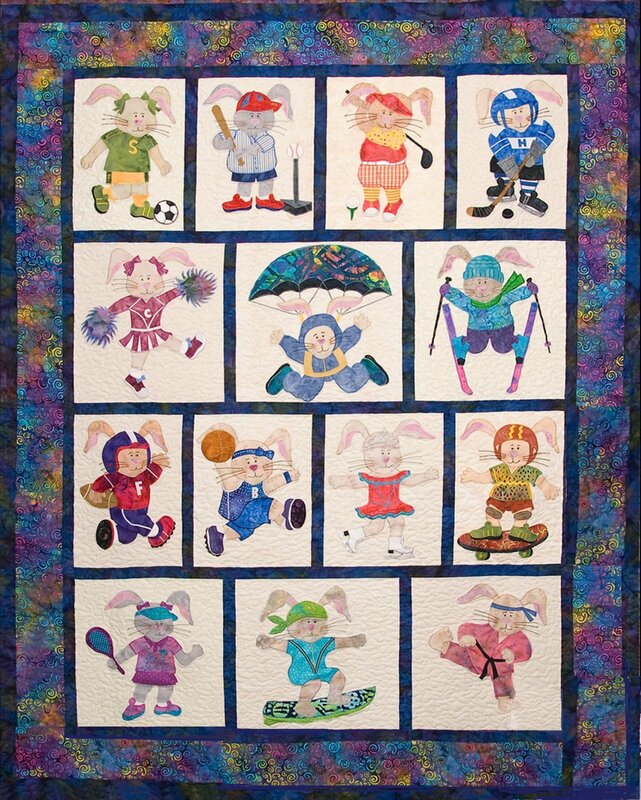 If you prefer a smaller quilt, perhaps geared to just girls or boys, you could achieve this effect by choosing seven blocks and insert your favorite bunnies. By changing clothing colours you can create your desired gender. Alternatively you may want to take one of the bunny designs and create a single wall hanging, (tote bag or cushion) as depicted on the pattern cover. Wall hanging 52½” x 68½” Twin quilt 65” x 81”.